A truck load of dogs (about 200) was stopped by activists in Kunming earlier today! All the dogs are cramped in tiny cages. They are sick, injured and some of them have already died. There are only about 10 activists on scene at the moment, more are rushing there. Local Police dept and the Animal Inspection dept are also on scene. The authorities have given two options to the traders: 1. Hand the dogs over to the activists. 2. Take the dogs back to where the truck came from. The traders have chosen to take all of the dogs back. The activists disagree with the outcome, because everyone knows that all of the dogs will die if they let the dogs leave with the traders. Negotiations between the activists and traders have come to a deadlock. The current situation is extremely urgent and critical. The local authorities have backed away from the situation and are no longer willing to interfere on behalf of the dogs. The activists are trying to stop the traders from taking the dogs back. They stayed up all night and have been fighting for the last 13 hours. There are not enough of them…although more people are rushing to the scene. A lot of the dogs are wearing collars and even tags! The traders showed a single Animal Health Inspection Certificate for all of the dogs on the truck. The dogs, however, are obviously very sick. In the “Purpose of Animals” section of the certificate is written: Farming (meaning that they are only allowed to be transported to a farm and not to a slaughterhouse). The certification is obviously ridiculous and than likely produced haphazardly by paid-off corrupt government officials. According to Chinese law, each animal bound for a slaughterer house must have a certificate of health. A single certification for all of the animals doesn’t even meet Chinese law, let alone the strange and nonsensical “Purpose of Animals” demarcation on the certificate. This whole thing is just sick. It is already midnight there in China. The volunteers are still on scene and protecting the dogs from the traders. It has been about 20 hours since the truck was stopped. A lot more traders and their gangster accomplices have arrived on scene, including the head trader. They are very violent and have gotten physical with the volunteers. They have also continuously threatened the volunteers. They told all of the volunteers that they had better to “be careful” as they will all be “taken care of”. More gangster accomplices are believed to come on scene. With the presence of the local police force, the volunteers are currently unhurt. However, the on scene activists are still taking an extreme caution just to stay safe. They always stay in a group to prevent attacks from the traders, even when going to the bathroom. There is an urgent call out online for reinforcements to come to the front line. All of the dogs are in an extreme critical condition. More dogs are dying as times goes by. Please pray for them.. . The woman with the hat is the head trader. She is one crazy monster. It’s early morning now in Kunming China. The situation is NOT getting better. There are only 5 female volunteers against more than 30 vicious traders and their gangster accomplices. The girls have blocked the truck from driving away with their car. There is an urgent online call out for more volunteers to rush to the scene. I pray for reinforcements to arrive soon! PLEASE post your picture with the posters to show your support! We need to all unite and fight with them in spirit! okay morning people, i’ve just got up of the bed. Good news and bad news. The good news is that there arr more volunteer on scene(about 15 of them). it is 6:50pm in Kunming and most people have got off work. therefore, more volunteers are rushing to the scene. Also, caring people from all over the nation have been keeping up the great pressure on the local gov officials by calling responsible depts. What the traders are doing are illegal even according to the existing Chinese laws. The front line volunteers and the off-scene reinforcements are working together restlessly to force the gov officials to release the dogs from the trader. but this needs to happen soon. The bad news is the dogs are getting weaker, they are dying. Whatever needs to happen to save the dogs, needs to happen soon. The traders are aggressive and ruthless. The local authorities have not only backed away from helping the activists, but also started to lend their helping hands to the traders. They are blaming the activists for the poor conditions that the dogs in. They claimed that the dogs have only gotten sick and died because of the activists stopped the truck and won’t let go of the dogs. Even one of the local TV stations suggested that the true purpose of the activists’s act is not to save the dogs, but to sell them afterwards or somehow make money off them. The authorities haven’t been very helpful still. The responsible officials have been avoiding people’s phone calls and questions. This whole thing is utter savage and absurd. It is going to be a crucial day for this fight when the sun comes up in few hours, as the shameless “Animal Health Certificate” of all of the dogs is expired on Apr 10th. I have received the following question from some of our supporters: Can we just buy all of the dogs from the money thirst vicious dog smugglers? This is always the question the animal rights activists in China ask themselves in every rescue. 1. The smugglers are asking for an absurd amount of money – almost $21,000USD for all of the dogs, many of which have already died or have very slim chances of survival even after being rescued. The smugglers are also demanding compensation for their monetary loss of this cargo caused by the activists’ “illegal actions”. They are blaming all of the activists for the sickness and death of the dogs. And the shameless authorities and news outlets have sided with the traders! 2. The activists, however, are generally trying to use money as a last resort to get the dogs. When all else fails, they are always willing to purchase the dogs if it is the only way to ensure that they would be rescued. There are unfortunately many, many trucks all over the country almost everyday. If we always resort to money then this will only further encourage the traders to steal/trap dogs in the hopes that they will be bought by people wishing to rescue them. Its a viscous circle that we are trying to break. There have been debate among the activists whether they should buy all the dogs. I think in the end, most of them decided that they are going to continue the fight for the long term goals of the fight for animals rights. This has been an absolutely heart-wrenchingly difficult decision for them to make and for everyone else to live with. In spite of money being taken off the table, the fight for these dogs is still by no means over. The people on scene are committed to doing all that they can for as long as they can, most likely until they are arrested. In spite of this potentially difficult news, please do not lose hope. We still desperately need your continued support. Most of you would not believe the huge impact that your daily words and messages have on the hearts of those who are fighting on the front lines to change the lives of all animals in China. There have already been terrible losses of innocent lives in this campaign, and there will surely be more before it is over. Nonetheless, we stand closer today to making true, lasting change than ever before. We cannot give up. Ever. Today might be the last day the activists have the chance to rescue these poor dogs, although the chances of winning is getting slimmer as we speak…Despite the fact that we might be fighting a losing battle, they activists have not given up. Most of the volunteers had to go back to their regular jobs as the day started. Again, there are only 4 volunteers and one car on scene right now to stop the traders from leaving with the dogs. Off-site activists have been calling responsible gov officials and also visiting them. More people will be going to the front line. The local authorities have been leaning more towards the side of the traders. They have been pressing the volunteers to come up with a “solution” – suggesting that only way the volunteers can have the dogs are paying traders total of almost $21,000USD for all of the dogs PLUS their business loss. The local news outlets have also been leaning even more towards the side of evil… We can no longer count on the shady shameless Chinese media outlets now, as all they have been doing is slandering and discrediting the rescue effort. Please keep on contacting everyone, every media outlet, every organization you know that may help the situation. Hang in there people! 2. Let the traders go with the dogs, PLUS give the traders compensation for their “business loss”. On top of all this, the police have become very aggressive towards the volunteers. They have now officially and shamelessly become ONE of the thugs. The challenge that this rescue has been facing is that we need more people at the front line. The An’ning Police dept has arrested two of the volunteers from the Yixin Stray Animal Shelter by force. They are forcing the volunteers to give money to the smugglers. The police have also agitated the local farmers to cause troubles and riot against the Yixin shelter. They are gathering together and threatening to kill all of the 1000+ animals in the shelter. The police have discovered the company that is behind the Yixin Shelter. They are threatening to cause problems for the company that could shut the company down. The company is the main financial sponsor of the shelter. I can’t eat, I can’t sleep, and I don’t know what else we can do people 😥 😥 😥 …Please god, help us. 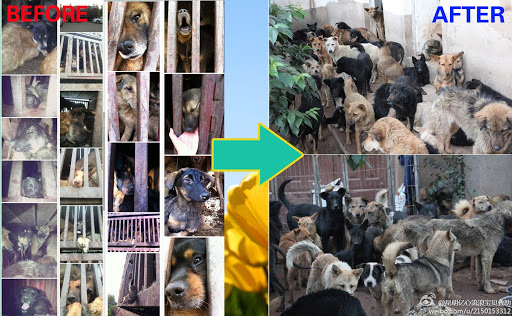 I have just found out that the volunteers bought all of the dogs for about $10,000USD (60,000RMB). This is the latest update. I will get in contact with the front line activists and find out more details. Please stand by people, as they may need financial aid. It was a painful and heartbreaking decision for the front line activists to make (See this post for why this particular decision was hard as it was　https://www.facebook.com/faclc/posts/516118485117741). They were forced to pay off the smugglers (I’m curious how much of a cut the An’ning police dept were promised). One of the volunteers that was arrested by the An’ning Police Dept, Xin Guo, is the owner of the Kunming Yixin Stray Animal Shelter. Once the police learned of this, they threatened to force the closure of the shelter by attacking and harassing the shelter and its volunteers, but also by inflicting all sorts of evil onto a company that is its main financial supporter. In fact, since this whole episode started, the shelter has already been twice “visited” by groups of aggressive and menacing local residents at the behest of the police. After the police brought the activists into custody, they informed that if they refused to pay nearly $21,000 for the dogs, that the shelter and its main financial sponsoring company will be shut down and that all of the 1000+ animals in shelter will be “gotten rid off”. The volunteers were so cornered that they forced to comply will with the police and smugglers. In the end, they were able to bargain down the original amount and were able to rescue the dogs by paying just short of $10,000. The Yinxing Shelter will now be able to take in all of the dogs without (hopefully) any further harassment or trouble from the police. The Kunming Yixin Stray Animal Shetler is one of the shelters that took in dogs (432 of them) from the March 5th Guiyang Dog Rescue last month. The shelter currently has 1000+ animal residents. The shelter has been at the frontline since the very beginning of this Kunming Rescue. 2. The shelter and activists will be preparing for a lawsuit against the dog smugglers, the An’ning Police Department, and the Inspection and Quarantine officials that issued the animal health certificate. I want to thank every one of you who have been standing with me, with the brave Chinese activists since the very beginning of this war. All your passion, devotion and contributions to this battle are inspiring and heart lifting for all of those good folks who fight against the evil in China. Personally, I cannot do this without every one of you. What is happening in Kunming right now is utterly horrific and soul-crushing. This war, however, has brought the right-hearted people together from all over the world. We unite here, side by side and hand in hand, to fight for a shared cause regardless of our differences of color, gender, religion and race, etc, etc. This is why evil can NEVER truly win! This is why we ARE going to fight harder than ever before, and we ARE getting closer to our victory! So my friends, this is NOT the end of this rescue. Please do NOT stop sharing this story with any and everyone that you can. Please do NOT stop contacting any media outlets and organizations you can think of. The story itself is already powerful and mind blowing, we just need to get it out! The brave Chinese activists and those poor innocent dogs deserve to have their story told. The shameless corrupt Kunming authorities and the evil heartless dog smugglers can NOT get away with all of their scandalous, corrupt actions. They will pay for what they have done! I want to apologize for not being able to respond to every single message and email that I have received from our supporters. It has been preeeetty insane these last couple of days… I will try to catch up with my inbox ASAP. Please be sure to also read the comments that people have made below nearly every post on this page, as there is a lot of VERY useful and helpful information. GREAT JOB everyone! Once again, thank you all SO very much for putting up such a great fight! It is indeed my honor to have you on my side! Tonight, keep all of the dogs in Kunming in your thoughts and hold your four-legged family and friends tighter. Love you all SO very much! Correction: As I mentioned in couple of my previou posts, the activists were asked to pay ￥60,000RMB (just short of $10,000USD) to the dog smugglers. 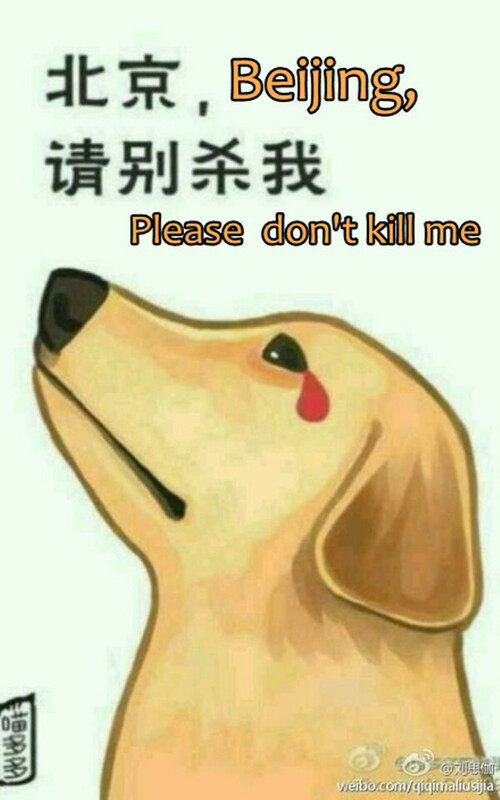 What I didn’t know back then is that the activists have also been forced to pay ￥25,000RMB (about $4,000USD) as a compensation for the dog smugglers’ “business loss”. The An’ning police dept has detained one of the volunteers’ car. the police is forcing the volunteers to pay all of the money today, otherwise they will confiscate the car. The volunteers requested to wait until their attorney is present. te request was ignored. instead, the police again threatened them with the Yixin shelter. the volunteers felt like they were again cornered. they are trying to at least obtain something written from the police to keep a record of this “deal” . The Yixin volunteers have also set up an online fundraiser campaign in china. it has, however, been hacked several times. te link has been forced taken down few times due to the attack. Fortunately, the shelter was still able to raise a substantial amount of money (about $4,300). I’ve shared the FACLC fundraiser campaign’s recent statues and activities on Weibo (Chinese version of twitter)。 the post has gone viral.the shelter, the volunteers, and many people saw the news are extremely grateful and moved. they responded “thank you for the love and support from our international friends”. love knows no nationalily. I’m in the process of wiring $4,000 of the collected fund made via FACLC Fundrazr to the shelter. it will take 2-3 business days for the money from paypal to be transfered. i will post any updates here on the page. Very sadly, the 4.7 kunming rescue has recieved many negative reponses from the general public in china. The main reason is that all of the local media outlets have been “instructed” and “ordered” to slander and discredit the rescue. the rescue efforts have been labeled as illegal actions. the volunteers have been labeled as criminals and scammers. the dog smugglersare believed be the legal owners of all of the dogs. the smuggling has been considered lawful. the full truck load of sick AND dead dogs has been believed to meet the Animal Health and safety code. The vounteers and their actions were questioned and even verbally attacked by a lot of people. The volunters and the shelter have been having an extremely difficult time to find an attorney who is willing to represent them, because no one has the balls to go against the chinese government. the volunteers hope they can find someone from outside of kunming to argue their case. There are A LOT more things i will share with you all, when the time is right. We are working restlessly to put pieces together. Please be patient and be prepared for the storm. All of the Yixin volunteers have been extremely busy with taking care of all of their animals. They haven’t had much time to post many updates on their social media site. I’ve just now briefly talked to some of the Yixin volunteers, as I didn’t want to take up so much of their time. A total of $7,800USD was wire transferred to the Kunming Yixin Stray Animal Shelter on Apr. 22nd.$5,878.30USD was collected through Fundrazer.com, and $1921.70 was donated directly to WGAPC’s paypal account from one of our generous supporters. There was a $40USD fixed bank fee charged for the international wire transfer. I will post the receipt that will be provided by the Yixin Shelter after they receive the donation. Thank you again everyone for your love and support. I continue to be blown away every time I see these numbers. Reporting on these stories and rescues is always very hard on my heart. When I see how quickly all of you have come together to support animals in China and the small group of activists trying to save them, however, I am always rewarded with a genuine smile and a reason to have real hope. I thank you all, with all of my heart. Thank you all and much love. 2. SEND THIS STORY TO ALL YOUR NATIONAL NEWSPAPERS, TV NETWORKS AND SHARE WITH EVERYONE! This is NOT the end of this rescue. Please do NOT stop sharing this story with any and everyone that you can. Please do NOT stop contacting any media outlets and organizations you can think of. This is just the start of this war, the activists in China are preparing for a bigger and longer battle. Write to as many public media outlets as you can in your country! Mainstream media outlets, animal rights and welfare organizations, celebrities…anyone/anything you can think of that might take this cause into the spotlight! Many of our supporters here on this page have already contacted numerous news outlets; very few have had any responses from any one of them. I think we may need to change our focus points when we write to them. Part of the problem is that animal rights abuses and even animal rescues have been covered multiple times by most large news agencies, superficially making what is happening now uninteresting to them. As you all know, there are now a number of very important differences between our efforts today and those in the past. Today, these animal rescues are the result of many activists from not only all over China but also all over the world acting in concert. This cooperation between Chinese and non-Chinese to make changes in China is something that is incredibly new and truly groundbreaking. Due to language barriers and China’s insular culture and history, people from outside of China have almost never been able to have a firsthand look at Chinese people actively fighting against injustice and corruption in real time. Today, people from all over the world can not only see and learn about activists fighting for change in China, but also help influence the outcomes. In other words, ordinary individuals from anywhere can be a part of grass roots social initiatives in China. All of these changes are due to the magic of the internet and social media. Although China blocks access to facebook, youtube, twitter, and other standard western social media outlets, it has its own domestic versions of each. Through these outlets, people from outside of China can now potentially contact and interact with the hundreds of millions of Chinese people who are active internet users. 1. How we were able to closely follow what’s happening with the rescue in real time without any delay, despite the Chinese government’s internet censorship and blockage. 2. How we were able to be actually part of the rescue and really make difference for the rescue and the frontline activists ( Financial aid: a substantial amount of donations raised quickly; emotional support for the Chinese activists when everything was working against them; our supportive poster message campaign; etc.). They can use their article as a chance to ask the questions has anyone (non-Chinese) ever had a chance or avenue to be involved in a social movement in China in a such an intimate way? 3. Talk about what you learnt about the Chinese animal rights movement, the activists and the An’ning authorities from this rescue. Not only that you learnt things that you never knew before about what’s really going in China, but that you were able to immerse yourself first hand. I think we can potentially get more media interest if we approach them with the angle that these rescue efforts are not only about saving animals and fighting corruption, but also about people from all over the world using the internet to join in the protest alongside the Chinese activists. Perhaps with the right emphasis, we can help them to see that these fights in China are not only just animal rescues, but a milestone in the social movement both in China and the world. Please sign all of these petitions：https://wgapc.org/petitions/ and share with as many people as you can! Please join us on Facebook and share as much as you can to raise awareness for animals and activists in China! God bless you guys! Dont give up! You are the brave voices against cruelty and evil. Don't give up! PLEASE DON´T GIVE UP !! Bless you for what you are doing to save them. If I was there I would help but I am on another continent in South Africa. You are doing brilliant work and it will get noticed. Even if you save only one. Good for you. My toughts are with you today. I visit this page all the time waiting for more news about how this continue. I can't stop thinking about you and I hope that all your efforts will pay off. Bless you!! I prey for you and all those dogs trapped on those trucks- Please don't give up u are their only hope and what u are doing is so very important don't loose hope -u and the dogs are always in my thoughts and pryers . If I could be there I would fight by your sidethank u for doing whatever u can for the dogs be safe and God bless you for being the good guys in the face of this great evil. Omg There are only 5 volunteers against 30 vicious gangsters, praying and doing what I can from downhere. Pls pls pls share this story with your newsstation and the whole world !!! You are in my thoughts and prayers. You are all so brave, I pray help comes soon! please make the changes happen. this is a friggin nightmare. Don't Give Up!!!! We are with you!!! I'm sending messages to the media now!! Please stay strong! My heart breaks for the dogs and all of you. Bless all of you and your heroic efforts. These dog traders are cruel individuals and this terrible crisis needs to be stopped! PLEASE DO NOT GIVE UP! YOU ARE THE ONLY HOPE FOR THOSE POOR DOGS!!! GOD BLESS YOU ALL!! those cruel pple sud b punished badly like da way they treat these dogs….dogs r supposed to b man's best frnd…wat r pple doing eating their meat..god bless dos dogs bt 4 nw dos who r fighting for these poor dogs r god…bless them…'PRAYERS ALL THE WAY FROM BHUTAN' KIP FIGHHTING…. I think we stop buying Chinese products until they stop eating dogs and cats,they obviously care about money,so put the pressure on there government,bet that would stop them. I DETEST harmful superstitions and the people who abide in them! Thank you for your help of the animals in China. The past year I've seen so many violence and cruelty against the animals in China. Horrible and cruelty situations such as skinning the animal alive! The devil butcher have absolutely no respect or compassion for the animal!Keep on going. I will folow you on Facebook. KARMA IS A UNIVERSAL LAW OF NATURE SO THAT MEANS TO THOSE WHO DONT KNOW OR DONT BELIEVE LOOK UP WHAT A UNIVERSAL LAW OF NATIRE IS AS RELATING TO KARMA! LAWS AND JAILS R WHAT STOPS MOST PEOPLE FROM DOING BAD THINGS SO YES THERE HAS TO BE LAWS DEMANDED!! I THOUGHT THEY WERE USING THESE DOGS FOR FUR, WHICH IS ALSO HORRIFIC BUT I HEARD THEY WERENT REALLY EATING THEM ANYMORE BUT I GUESS THEY SURE ARE. YES WE SHOULD STOP BUYING THEIR STUFF TOO AND I TRY TO ALREADY BUT TAKE NOTICE HIW SO MUCH CRAP COMES FROM CHINA, THEY WERE HAVING ALL THOSE PROBLEMS WITH DOG TRETS THAT PEOPLE BOUGHT OVER HERE AND THEIR PETS GOT REALLY SICK AND I THINKQUITE A MANY DIED AND THIS WAS NOT LONG AGO!! SHAME ON THESE PEOPLE, THE CHINESE THAT ENGAGE IN THIS!! THE DOGS HAD COLARS SOME OF THEM IT SAID, DOES THAT MEAN THEY STEAL OTHER PEOPLE"S DOGS TOO? THEY JUST ROUND UP DOGS FROM THE STREETS OR? GOD BLESS THE ANIMALS IN THE WORLD TODAY EVERYWJERE AND ALL THAT HAVE A GOOD HEART TO HELP THEM FROM SUFFERING!! AMEN. All the people they catch killing animals for their fur, to eat or for any reason should be put in a huge pen where they can't escape. Then they should turn a bunch of trained killer dogs loose on them and let them rip them apart piece by piece. I would love to watch that video. Thank u brave rescuers! We pray for all of you! Never give up! Thank you for helping the inocent and defenseless!!!! the world is behind you and we hope we can do more to help you and this poor animals…..WE PRAY FOR YOU AND THOSE CREATURES!!!!! KARMA IS WATCHING!!!! Please dun give up guys.. am helping every way i can please dun give up. This has got to stop. They are beating, starving and worse to these poor dogs before the slaughter them to eat them! Some are stolen pets with collars and tags still on them. Please show this to the public! We have to help them!!!!! Sorry I thought my comment would go to the website I posted! Thank you so much for what your doing there! It has to take a strong individual to do what your doing! I’m afraid I would lose my head and try to set them free and end up in jail there. I would go mentally insane and that wouldn’t help them. Omg I can’t stand this! Their poor little faces BREAK MY HEART!!!!!!! These people are EVIL!!!!! I have been praying for these animals over there since I found out about it 3-4 months ago! I’ve signed petitions, I’ve written people and have asked churches for prayer! I’ve prayed for people like you without even knowing who you were! Please don’t ever stop fighting! I don’t know what I can do other than what I’ve done already but if I can help please let me know.